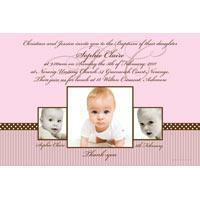 Girl Baptism, Christening and Naming Photo Invitations are a great way to invite family and friends to your daughter's celebration of life. 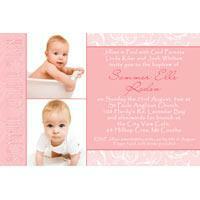 Please browse my range of Girl Baptism, Christening and Naming Photo Invitations and Thank-You Photo Cards personalised photo cards to find your perfect photo card. 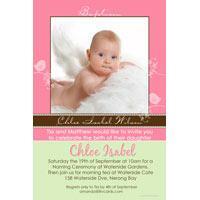 Fill out the order form and email the picture(s) you would like on your photo card Baptism, Christening and Naming Photo Invitations and Thank-You Photo Cards to amanda@ilivcards.com. 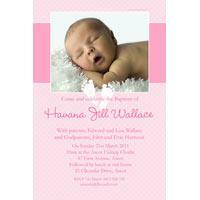 Once I have received this I will prepare a proof of your personalised photo cards and email it back with in 24 hours. 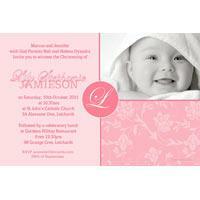 I am happy to personalise your photo card Baptism, Christening and Naming Photo Invitations and Thank-You Photo Cards by changing fonts, colours and photo boxes. 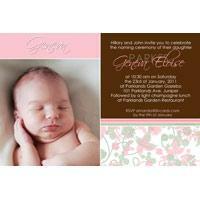 If you had something in mind or a theme to the party and can't see a design that would fit I do custom Baptism, Christening and Naming Photo Invitations and Thank-You Photo Cards.